Oak, Ash, Beech, Apple etc. We do Seasoned Hardwood Logs and Kindling all year round and are a main distributor of Home Fire ecoal, Coalite, and House Coal for the South East. 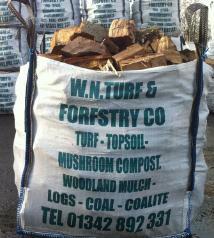 We also do Turf, Topsoil, Playbark, Woodland Mulch, Mushroom Compost. Inc Vat. FREE LOCAL DELIVERY or Collection.